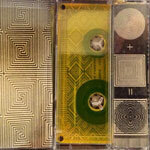 New tape by Tenshun, on a c20 tape in an translucent amber shell. All new beats with that distorted filthy lo-fi sound. Listening to this makes you feel like you're in a dark tunnel under the city with a couple a spray cans writing messages for the under world to translate. Tenshun has been ill with the drums and had a crazy sample game for the longest and he just keeps getting better. Make sure you hurry if you want a copy of these dark and trippy beats.